My dear Fathers, I hope you were able to take some rest after the intense period of the Holy Week and the Sacred Triduum. I was in Nuwara Eliya from the 12th—16th of April and was able to do some mini-pastoral visits to some scattered communities such as Mahauwa, Dayagama , Mattakelle,Dessford ,Shanthipura, and Kandapola.In a relaxed atmosphere it was a joyful experience to meet the communities and celebrate the Eucharist with them. In fact, learning from this experience, when I come for Confirmation Services that is the kind of program that I wish to follow as it will give me an opportunity to visit some communities specially those who are far away from the main Church. Please consult me when I am due to visit your parish regarding such programme so that we can plan together. The parish of Rotawewa will have a memorial Mass for their much beloved pastor who built the new Church namely late Fr. Nilanka Dias on the 1st of May at 10.00 am. I shall preside over this memorial Mass and I invite priests in Matale Vicariate to join me. We have happy memories of him and let us continue to pray for his soul. 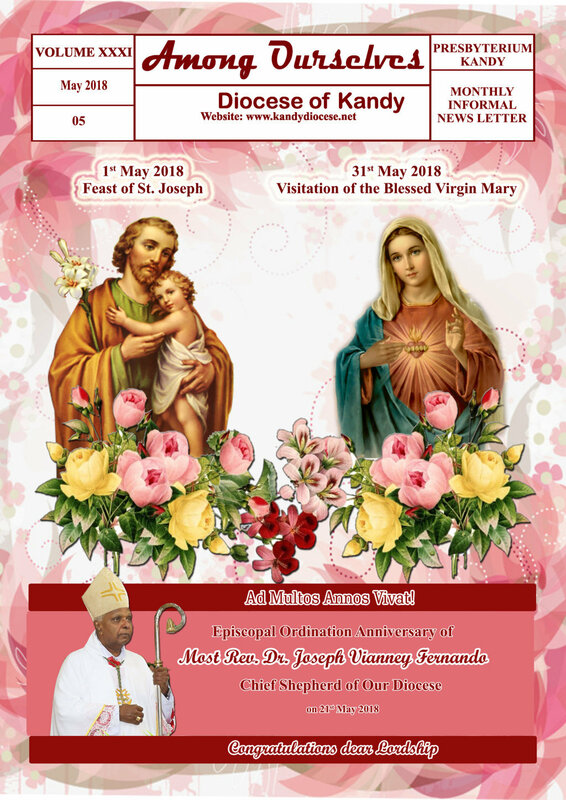 We had our Presbyteral Council meeting on the 19th of April and the main topic was the parish level programmes for “the year of deepening our faith commitment in view of becoming witness to the Risen Saviour and the Gospel, following St. Joseph Vaz”. A task force has been appointed to draw up a draft plan with ideas that emerged both at our Diocesan Pastoral Council held on 17th March 2018 as well as the proposals of the Presbyteral Council held recently. We need to expedite the implementation of parish level programmes if we are to build faith-filled and witnessing communities. Please note that any project proposal for seminars and other events that you wish to send up to the Department of Christian Affairs should be approved and endorsed by the Bishop. 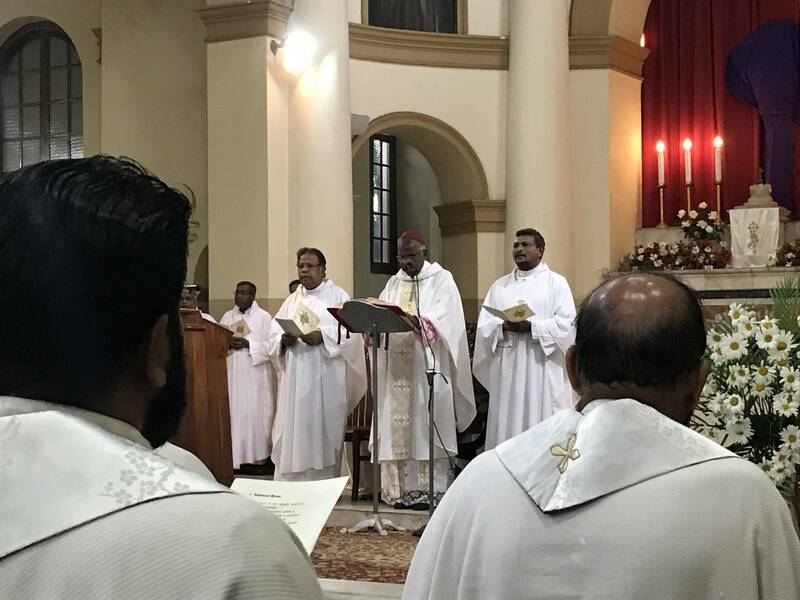 This requirement has been agreed upon by the Catholic Bishops’ Conference of Sri Lanka and the Ministry of Christian Religious Affairs. Please abide by this stipulation strictly to ensure that the maximum benefit can be obtained from the funds made available by the Government through the Christian Affairs ministry. 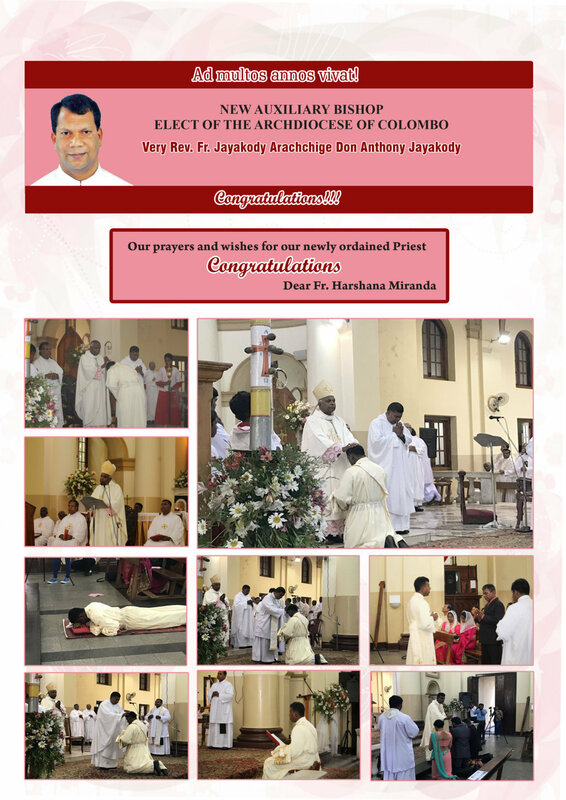 We rejoice with the Archdiocese of Colombo over the appointment of the Bishop Elect, Mong J.D. Anthony, as the Auxiliary Bishop. We wish him God’s blessings and the outpouring of the Holy Spirit as he prepares for his Episcopal Ordination in the month of June. Wishing all of you God’s blessings and in union of prayers. Pope Francis is often called a “man of Vatican II.” In his newly-released Gaudete et Exsultate, he offers a powerful magisterial reflection on the Council’s “universal call to holiness”: “Rejoice and be glad” (Mt 5:12), Jesus tells those persecuted or humiliated for his sake. The Lord asks everything of us, and in return he offers us true life, the happiness for which we were created. He wants us to be saints and not to settle for a bland and mediocre existence. (§1) Gaudete et Exsultate (GE) is an apostolic exhortation, a type of document that ranks below an encyclical but above everyday papal homilies and speeches. It is the third one issued by Francis, after Evangelii Gaudium and Amoris Laetitia. Evangelii Gaudium has been roundly praised as a “charter” for Francis’ papacy, while Amoris Laetitia has been at the center of numerous controversies since its publication. While GE is not likely to stir as much controversy as Amoris Laetitia, there is no question that it will be read with an eye toward pre-existing controversies. But no praise or criticism will do sufficient justice to GE that fails to recognize its simple premise: God calls us all to holiness. Below TJP offers a summary and reader’s guide of GE. We hope it will inspire you to read the document yourself. Introduction (§§1-2) GE is meant to be practical: it is not “a treatise on holiness, containing definitions and distinctions helpful for understanding this important subject, or a discussion of the various means of sanctification.” Rather, it is a meditation on how to respond to Christ’s invitation to be saints: to “Rejoice and be glad,” (§1). Chapter 1 (§§3-34): The Call to Holiness In this chapter, Pope Francis discusses the diversity of forms under which holiness appears: “We are all called to be witnesses, but there are many actual ways of bearing witness,” (§11). Besides those saints and martyrs whose lives were “an exemplary imitation of Christ,” Pope Francis also praises “the middle class of holiness”: the everyday sanctity of “those parents who raise their children with immense love, in those men and women who work hard to support their families, in the sick, in elderly religious who never lose their smile,” (§7). “The Holy Spirit bestows holiness in abundance among God’s holy and faithful people,” the Pope writes, which begins from baptism (§15). Here he invokes the theme of the universal call to holiness, citing Lumen Gentium §11: “all the faithful, whatever their condition or state, are called by the Lord – each in his or her own way – to that perfect holiness by which the Father himself is perfect”. Pope Francis emphasizes the phrase “each in his or her own way,” for the diversity of forms of holiness means that Christians must discern how the Lord is calling each of them to holiness. While there are many good forms of life, every person has a unique vocation to whom he or she is called by God. Significantly, Pope Francis notes here that Saint John of the Cross “preferred to avoid hard and fast rules for all. He explained that his verses were composed so that everyone could benefit from them “in his or her own way”. For God’s life is communicated “to some in one way and to others in another”,”(§11). This will remind many of Francis’ constant insistence on the necessity of discernment and prudence concerning individual cases – a theme that many love about him and others find difficult to accept. But here he goes deeper: that particularity is requisite not just by the nature of discernment or morality, but by the nature of God’s very call to each human. As he often does, Pope Francis makes specific mention of women in this section, both those holy women like Saint Hildegard of Bingen or Saint Teresa of Avila who emerged in times “when women tended to be most ignored or overlooked,” but also those “unknown or forgotten women” who nurture those around them in ways that we know have personally touched Pope Francis deeply (§12). While everyone has a unique vocation, every mission “has its fullest meaning in Christ, and can only be understood through him,” (§20). Here Pope Francis is at his most Jesuit. To be Christian is to be a discipline of Christ, meaning to enter into the Gospel itself. “At its core, holiness is experiencing, in union with Christ, the mysteries of his life.” Contemplating the mysteries of Christ’s life, death and resurrection, “as Saint Ignatius of Loyola pointed out, leads us to incarnate them in our choices and attitudes,” (§20). This section is in many ways tailored to the hopes expressed by young people at the Pre-Synodal Meeting this past March: “Young people understand the general sense of bringing meaning to life and being alive for a purpose, but many do not know how to connect that to vocation as a gift and call from God.” Pope Francis tells them in this exhortation: “You too need to see the entirety of your life as a mission,” (§23). Chapter 2 (§§35-62): Two Subtle Enemies of Holiness This chapter concerns “two false forms of holiness that can lead us astray: gnosticism and pelagianism,” (§35). This material will be largely familiar to those who follow this Papacy, and particularly to those who read the recent CDF Instruction Placuit Deo. In the context of this exhortation, however, and in words that harken to Evangelii Gaudium, Pope Francis notably underlines how these tendencies draw oneself and others away from holiness: whereby instead of evangelizing, one analyses and classifies others, and instead of opening the door to grace, one exhausts his or her energies in inspecting and verifying. In neither case is one really concerned about Jesus Christ or others”. §35 Also noteworthy: this section contains the most learned footnotes of the document, including citations of the Council of Trent; the Catechism; the Second Synod of Orange; Saints Augustine, Thomas Aquinas, Bonaventure, Thérèse of Lisieux and Pope John Paul II; and a dozen Scriptural citations. While these references are hardly unusual for a papal document, this section is at times more intellectual than the introduction to GE promises. These citations perhaps say something about the sort of readers the Holy Father is seeking to persuade in this section. Chapter 3 (§§63-109): In the Light of the Master Chapter 3 centers on the example of Jesus, particularly in an interpretation of the Beatitudes and Matthew 25. For while there “can be any number of theories about what constitutes holiness, with various explanations and distinctions… nothing is more enlightening than turning to Jesus’ words and seeing his way of teaching the truth,” (§63). Pope Francis writes that “Jesus explained with great simplicity what it means to be holy when he gave us the Beatitudes (cf. Mt 5:3-12; Lk 6:20-23),” such that “The Beatitudes are like a Christian’s identity card,” (§63). The Beatitudes are thus our guide to doing what Francis urges us toward in Chapter 2, namely imitating Jesus. “For those faithful to God and his word, by their self-giving, gain true happiness,” he argues (§63) . In this chapter, the Pope notes two “ideologies striking at the heart of the Gospel”: “those Christians who separate these Gospel demands from their personal relationship with the Lord, from their interior union with him, from openness to his grace,” and “those who suspect the social engagement of others, seeing it as superficial, worldly, secular, materialist, communist or populist,” (§100). The Church is more than an “NGO,” Francis argues, but one should also affirm the good of one’s neighbor as integral to the Christian life. Francis elaborates on this second point at some length, invoking St. Thomas Aquinas again to argue that “works of mercy towards our neighbour” give greater glory to God than even acts of worship (§106). One of the most “Franciscan” moments in the text comes here: Our defence of the innocent unborn, for example, needs to be clear, firm and passionate, for at stake is the dignity of a human life, which is always sacred and demands love for each person, regardless of his or her stage of development. Equally sacred, however, are the lives of the poor, those already born, the destitute, the abandoned and the underprivileged, the vulnerable infirm and elderly exposed to covert euthanasia, the victims of human trafficking, new forms of slavery, and every form of rejection. (§101) Popes are pro-life, but not everyone sees Pope Francis as tough enough on this issue. His defense of “the innocent unborn” then, will be as surprising to those for whom it does not fit their narrative about Pope Francis. On the other hand, Francis underlines this defense to a vigilance for the whole human family, including the migrant (§102). Chapter 5 (§§158-201): Spiritual Combat, Vigilance, and Discernment The title of this chapter reminds us that the Pope is hard to put in a box: “spiritual combat” will sound old-fashioned and even reactionary for some. But Pope Francis makes no bones about his purpose in writing this way: The Christian life is a constant battle. We need strength and courage to withstand the temptations of the devil and to proclaim the Gospel. This battle is sweet, for it allows us to rejoice each time the Lord triumphs in our lives. (§158) Pope Francis continues that we “are not dealing merely with a battle against the world and a worldly mentality,” or “against our human weaknesses and proclivities… It is also a constant struggle against the devil, the prince of evil,” (§159). And the devil is real: “Hence, we should not think of the devil as a myth, a representation, a symbol, a figure of speech or an idea.” (§161) (Someone needs to send this section to Eugenio Scalfari.) The spiritual life demands vigilance and keeping our “lamps lit” (§164). Progress in the spiritual life does not secure one from the devil’s snares. Indeed, the “spiritual corruption” of such persons “is worse than the fall of a sinner, for it is a comfortable and self-satisfied form of blindness,” (§165). While Pope Francis does not make this connection, one could imagine the Gnosticism and Pelagianism of Chapter 2 arising from this corruption. Pope Francis ends the chapter by posing a question, the answer to which is his favorite subject. The question: “How can we know if something comes from the Holy Spirit or if it stems from the spirit of the world or the spirit of the devil?” The answer: discernment. Discernment, of course, has been at the forefront of many discussions surrounding this papacy. At root is the question whether “some novelty… is new wine brought by God or an illusion created by the spirit of this world or the spirit of the devil.” But not only choosing new directions requires discernment, Francis urges, but also staying the course: “At other times, the opposite can happen, when the forces of evil induce us not to change, to leave things as they are, to opt for a rigid resistance to change.” Francis has spoken against the “rigidity” that he says often refuses to countenance needful change in Church disciplines. Such persons, he says, “block the working of the Spirit.” But “[w]e are free, with the freedom of Christ,” (§168). Discernment, the Pope writes, should be exercised in matters great and small. Followers of this papacy will note that he takes this occasion to smuggle in again his favorite phrase in a footnote: “Non coerceri a maximo, conteneri tamen a minimo divinum est (“Not to be confined by the greatest, yet to be contained within the smallest, is truly divine”). Discernment is “more than intelligence or common sense. It is a gift” from the Holy Spirit (§166). Indeed, while “spiritual discernment does not exclude existential, psychological, sociological or moral insights … it transcends them.” Further: Nor are the Church’s sound norms sufficient. We should always remember that discernment is a grace. Even though it includes reason and prudence, it goes beyond them, for it seeks a glimpse of that unique and mysterious plan that God has for each of us, which takes shape amid so many varied situations and limitations. (§170) Here we again see the Holy Father in dialogue with those who think his teaching on discernment does not sufficiently heed the normative force of Church teaching. Moreover, it “is not about discovering what more we can get out of this life, but about recognizing how we can better accomplish the mission entrusted to us at our baptism,” (§174). Indeed, despite being mentioned explicitly only twice, baptism is a pervasive theme of this work: “Let the grace of your baptism bear fruit in a path of holiness,”(§15). Had this been an encyclical on the call to holiness, baptism might have figured more prominently in this text. Finally, those conversant in Ignatian spirituality will appreciate the Pope’s admonition to pray “in dialogue with the Lord, a sincere daily “examination of conscience”,”(§169). Such an examen would be sterile were it not a discernment of spirits, and discernment would not be complete were it not the constant attitude of prayer that the examen fosters. In writing on the call to holiness, Pope Francis has given us a text on the reception of a fundamental Christian teaching, one that was profoundly reinforced by Vatican II. In this way, the document puts the Pope in very deep harmony with Scripture and Catholic tradition. Yet Pope Francis is himself deeply associated with this teaching, and GE shows why: Francis gives the call to holiness an earthy concreteness and beautifully humble instantiation in his own life. But we again run into what Chris Lowney calls the “Gandhi problem”: Pope Francis has given us a model. Will we follow it? As with much that Pope Francis writes, there are many spiritual gems in GE, and many tantalizing possibilities for how it might be instantiated in the life of the Church. This pluripotency means that some will find it lacking in necessary clarity. Perhaps these may be the same people Pope Francis criticizes in Chapter 2. And Pope Francis will no doubt encourage such people to hacer lío in stating their concerns. But, as with many of his other writings, in GE Pope Francis sees the problems in the life of the Church not as theoretical, but as moral and spiritual. If there is a theoretical problem, he says, it has to do with the spiritual sickness of those who think they know what counts for holiness. This is perhaps why he wrote an apostolic exhortation, and not an encyclical. The flashiest take-away from this document will be on discernment, and what it means for synodality, papal authority and the pastoral applications of Church teaching. I would like to close, however, with a thought on the tension in GE between “holiness of the middle class” and avoiding mediocrity. This is an important tension for Pope Francis, a man who exhorts us to give up everything for God and be like the saints, and yet who also worries that we don’t recognize and cherish sanctity in the ordinary. On the one hand, Pope Francis wants us to see the holiness of those around us, of the people and in the places we already find ourselves among. On the other hand, Pope Francis asks us how that holiness can be known, loved, and practiced, so as to bring us closer to God. He nudges us, in other words, toward the magis. How appropriate that a Jesuit pope would lead us to see the intimate connection between the universal call to holiness and the magis of St. Ignatius of Loyola. For what else did Ignatius seek but holiness? The month of May is a special time for us Catholics to pay homage to our Blessed Mother Mary. We have some good Marian Prayers for different occasions and intentions listed here. Note that I say we pay homage to her. Contrary to a distressing misconception found among Evangelicals and Protestants, we honor Mary. We do not worship her. She has a unique role in salvation history as the Mother of God, conceived without Sin, who by her own free will agreed to bring the “Word made flesh”, (John 1:14) our Lord and Savior Jesus Christ into the world. Mary is prefigured as the one who would crush the head of the serpent (a figure of Satan) in Genesis 3:15 through her Divine Son. Still she in no way overshadows Him, nor would she ever wish to! Her life in the Gospel years was one of service and great devotion to Jesus, from the cave in Bethlehem where she gave birth to Him, to Calvary in Jerusalem where she stood by His cross in His Crucifixion, from Crib to Cross, as it were. While she has a somewhat low profile in the Gospels, her words there still resonate with us today and challenge us to follow her example of humility, obedience, and service to God. We read when she gives her famous assent to becoming Jesus’ mother: “Behold the handmaid of the Lord; be it done to me according to thy word” (Lk 1:38). A short time later she proclaims with joy in the Magnificat when visiting Elizabeth, her relative, that “My soul magnifies the Lord, and my spirit rejoices in God my Savior” (Lk.1:46-47). And, last but not least, what are her final words in scripture? “Do whatever he [Jesus] tells you” (John 2:5). (This is her request to the waiters at the Wedding Feast at Cana right before Jesus turns water into wine with just a thought). The paucity of references to Mary in the Gospels has made many Evangelicals and other Protestants, as well known author Mark Shea once speculated, think of Catholic devotion to her as something somehow pagan, as if we were somehow deifying an ordinary woman, turning her into some kind of interloper hindering our worship of Christ. Yet in creating her to be the only human being without the stain of Original Sin (outside of Jesus, of course, who had both a Human and a Divine nature), God nonetheless chose Mary specifically to play a vital role in our salvation. Mary’s Immaculate Conception enabled her to bear her Divine Son in a womb free from any taint of sin and enabled her to devote her life to Jesus in the most loving and devoted manner possible. (Can you imagine what might have happened if she had been prone to the kinds of weaknesses of human nature we all suffer from? If she were somehow jealous of her Divine Son, for example, or was otherwise unwilling to bear with the great sorrows as well as the joys as the Mother of our Lord!) Speaking of sorrows, Jesus, as He was dying on the Cross, gave us His mother to be our Mother as well when he entrusted her to St. John’s care (Jn 19:26-27) Numerous theologians and Saints have confirmed this. Mary was conceived and lived a life “full of Grace” (Lk. 1:28). And she wishes very much to share the graces given her by God on our behalf. St. Bernardine of Siena once said : “Every grace that is communicated to this world has a threefold course. For by excellent order, it is dispensed from God to Christ, from Christ to the Virgin [Mary], from the Virgin to us.” Pope Pius XII was by no means alone when he once said “Whenever we speak of Mary or speak to her, let us not forget that she is really our Mother, for through her we received divine life. She gave us Jesus himself, the source of grace. Mary is a Mediatrix and Dispenser of Graces.” Many non-Catholic Christians may take issue with this notion, referring to the famous quote from St. Paul in his letter to Timothy that “there is one mediator between God and men, himself man, Christ Jesus” (1 Tim 2:5). Yet it is important to note that “one” here means “first” not “only”. Have you ever asked someone to pray for you? That’s the kind of mediation we’re talking about here. And Mary, as the beloved Mother of God, makes a powerful intercessor for us indeed! Note also that Mary’s many church-approved apparitions on behalf of her Son (such as Our Lady of Guadalupe and Our Lady of Lourdes) serve to further reinforce our faith that Jesus is indeed the Son of God and the Second Person of the Trinity functioning on a dazzling supernatural plane. His Earthly ministry wasn’t just that of some philosopher or some wise teacher! Our Blessed Mother has shown us some amazing miracles on His behalf that can strengthen our faith. (Think of the “Miracle of the Sun” from Our Lady of Fatima, for example!) In these and other such apparitions she has urged all of us “Banished children of Eve” to adopt greater piety and devotion to God and neighbor. (But do we listen? That’s the question!) She has also given us a great weapon in our Spiritual arsenal in the Rosary. St, Francis de Sales called it “the greatest method of praying”. Blessed Alan de la Roche said this prayer is “the storehouse of countless blessing.” And St. Padre Pio once remarked that “the Rosary is the weapon given us by Mary to use against the tricks of the infernal enemy.” It not only brings us graces, but also is a great way to meditate on the lives of Our Lord and His Blessed Mother! Mary herself once told Blessed Alan that “when you say your Rosary, the angels rejoice, the Blessed Trinity delights in it, my Son finds joy in it too, and I myself am happier than you can possibly guess. After the Holy Sacrifice of the Mass, there is nothing in the Church that I love as much as the Rosary.” Remember that Mary always seeks to be a bridge not a barrier to Her Divine Son our Lord and Savior Jesus Christ! Don’t ever feel afraid to approach her in prayer for grace, strength and her intercession to Jesus for your personal intentions! It is now three months after the death of Fr. Nilanka Dias. He is no more with us. Though he is no more here with us physically, he is always present in our memories and emotions . Death of a priest is unlike any other. We feel it deeply and differently. Because he is a Christ Bearer to everyone. We have lost not only the person but also a unique manifestation of God’s love. His voice is silenced now but he speaks to us each moment. Yes, his deeds spoke louder that his words because of father acted in the person of Christ. He showed the people the face of Jesus. Once it was Easter Sunday. A man who received the Holy Communion spit it into his palm and was ready take it home. Sr. Salette FMM saw it and took the Holy Host back from him, and brought it to the Sacristy on a corporeal to show it to the priest. But Brother Nilanka consumed the chewed blessed Sacrament without making a big issue. He was a man of prayer. In the later years he frequented Supuwath Arana and attended the retreats at Chalakudi India. A Good Shepherd Fr. Nilanka was a good shepherd. He knew his Sheep and they know him very well. When we were students in the seminary, he was next to my room. We used to study together during the exams. Father would say that he would be satisfied with mimimum marks. “ Our people in the diocese not only want scholars but shepherds to be with them.” Therefore, he was very keen in learning the languages and culture. He was very much convinced that if we knew the languages we would give a better service to God in our Diocese. I also remember late Fr. Kingsley Silva was a lovable priest at Talawakelle. He used to say “I don’t know Tamil language and you don’t know Sinhala language but we knew the language of love. Let us correspond with it.” However, Fr. Nilanka spoke all the languages thoroughly. He learned Tamil very well. So to say that When he was asked to preach in Sinhala he would mix some Tamil words in his sermon. He was passionate and immersed in the love of Tamil language. It was for the first time that he created an opportunity for Kadienlena Parish children, participated in the competitions in the Diocese. 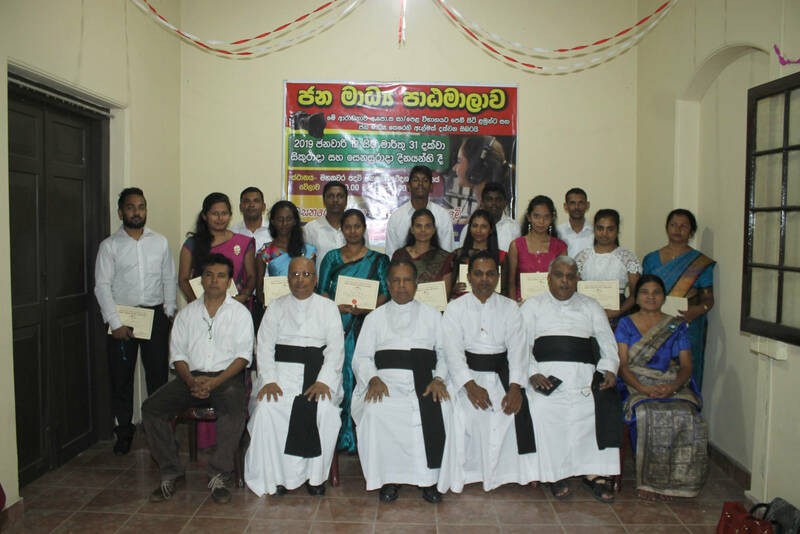 As the First Parish Priest of Kadiyelena, he had prepared the children to participate in all the competitions such as Bible Quiz Speech and dance at Gampola. He was the happiest parish priest on that day. He was carrying a little girl who won the competition and asked me to a take photographs as a proud priest. I can remember the dancing team also won a place but he was worried that he could not provide them with good costume. He knew the Mass and the rites of administering the sacrament by heart. Once we were attending a funeral, And he requested me to do the rite in the house. I received the ritual and was searching for the pages of funeral rite. He told that it was in page 169. To my amazement while coming back, he was telling all the page numbers of each ritual in the book. A good Friend He is a friend of all. He belongs to each family in the Hill Country. He used to visit his friends in all the parishes and kept them in contact over the phone. He maintained a good relationship with all the priests in and out of the diocese, nuns of all whom he knew brothers as well. He was welcoming and was hospitable to everyone who visited him. He was seen at all the funerals, church feasts and occasions of his friends. A Man like St. Francis of Assisi Fr. Nilanka had a black dog without any white spots on her. But he was thrilled calling her SUDU (white). He had all the pet animals, birds and beautiful plants around his mission house. I told him “ Don’t keep these Aamai (turtles) at home.” He retaliated saying “we can keep Aamai at home but we should not keep Pora- amai( Jealousy), kallaamai (illiteracy) and Ariyamai (ignorance) at home.” He loved all his animals and birds calling them by name. An artist and Sportsman Father played the flute very well. He participated in the Gosia Orchestras whenever he got an opportunity in the seminary. He took part in Tamil dramas and Dances. When we came together as Kandyans he lead the “baila” singing and dancing. He used to sing this Tamil song very often while driving. Leaving the steering he sings. “Nan pogiren Mele Mele” ( I am going higher and higher). That was the last song he sang in the priests- gathering. He played Cricket, football and basketball. He was a left-arm bowler but was a right-hand batsman. Even during the Mass, he distributed the Holy Communion and blessed people by the right hand but sprinkled the holy water by the left hand. 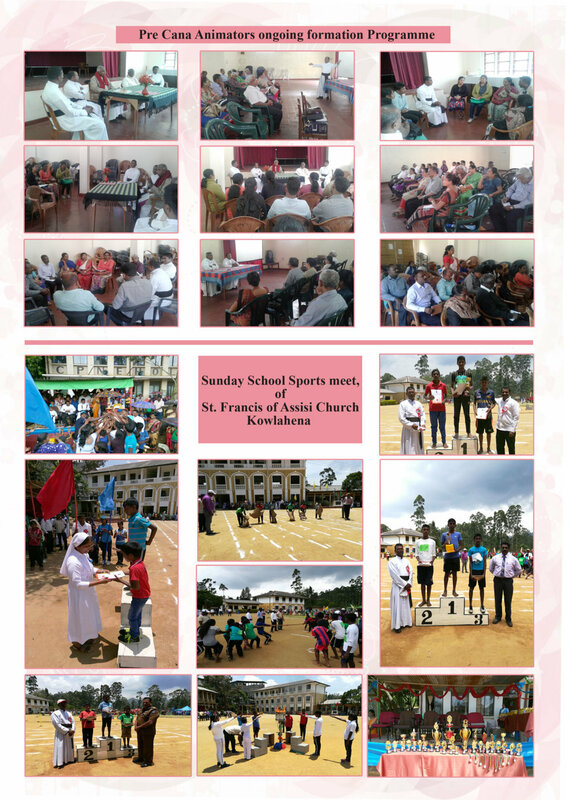 He was the Carom champion in the minor seminary sports meet. He was fondly called Tikri and “the Barrel.” He used to drink a lot of water. Usually in the minor Seminary, the doors to the refectory were closed before the night prayers. So we were requested to take water before that. Father Nilanka goes in, fills his bottle, and comes out. However, before he reaches the gate near the visitors room he would finish drinking the bottle of water and goes back again to the refectory. A fondly remembered friend He is fresh in our memories. He lives in all the hearts on the hills. His life of simplicity, love and concern for the poor people is a challenge and example to be followed. We cannot forget you Father. May your soul rest in peace. A man who is a master of patience, is a master of everything. Of all the things you wear, your expression is the most important. Vision without action is a day dream, Action without vision is nightmare Experience is what you get, when you don’t get what you want. You can’t change people, but you can effect a change by your behavior. Nature does not hurry, yet everything is accomplished. Anger management is being upset in an appropriate way. All men make mistakes, but only wise men learn from mistakes. Only people with full stomachs become environmentalists. A ship is safe in habour but that’s not what ships are for. Happiness is not something readymade. It come from your own actions. Peace begins with a smile.